I'm not sure where to put these kinds of questions, so I'll put them here and move them if they find a home. 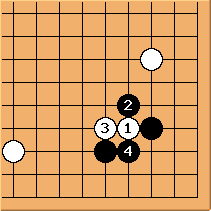 The position below occurred in one of my games, and I wasn't sure if the straightforward (for this KGS 15kyu) response at a was best. It seems like such a bizarre move, can anyone help? Bob McGuigan: Absolutely a is a good move, perhaps the only move locally. Just remember that a major goal is to keep your stones connected. 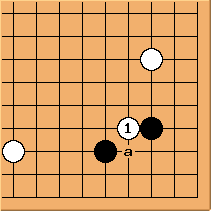 aims at playing a next to disconnect the black corner stones, so the natural move is to connect them at a. If was played as a ko threat, it is quite a big one. See Cutting right through a knight's move is very big. Hicham: a is the only move I would seriously think about. You would need a very good reason the let yourself be cut in two. So,not counting very special circumstances, a is the only move as Bob said. Just trust your instincts. Note: The game was played on 03/26/2000 in the 1st Nongshim Cup.